Camping season is right around the corner, and that means many of you are looking for a tent to get you through the summer in comfort. Going on now through March 31st, Amazon is offering a great deal on select already-discounted Coleman camping gear. Take $20 off your purchase of $100 or more, plus get Free Shipping ($20 will be deducted at the final page of checkout). We’ve done the research for you and found three great tent options at unbeatable prices. 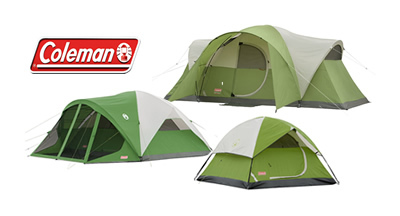 The top-rated Montana 8 tent (2000001594) from Coleman comfortably sleeps 8 with its 16 x 7′ footprint. Simple to assemble, it features an electrical access port and reverse angle windows. With Amazon’s $20 off discount, you can buy this today for the incredible price of just $99.99. Not only is this the absolute lowest price we’ve ever seen on this tent, it is currently selling at other retailers for much more. If you’re looking for a reliable, easy to assemble tent at a great price, this is the one for you. The Evanston 8 Screened tent (2000007824) from Coleman features a fully screened front porch to keep the bugs out. Easy to set up and guaranteed to keep you dry. With a roomy footprint of 15 x 12′, the Evanston sleeps up to 8 people comfortably. And with four large windows for maximum ventilation, it is perfect for all your summer camping trips. With Amazon’s $20 off special, you can pick up this item for only $158.47 with free shipping. The last time we saw prices this low on this tent was back in August of 2011, so you can be assured you’re getting a great deal AND a great tent. If you’re looking for a good basic tent, look no further than the Sundome 3-Person tent (2000007828) from Coleman. Perfect for car campers, solo travelers, or beginner campers, this 7 x 7′ tent features an exclusive WeatherTec System and adjustable airflow ventilation to keep you dry and comfortable. With privacy vent window and vented cool-air port. Simple set up. Available now at Amazon.com for $59.58, you can save an additional $20 when you add an additional participating Coleman item to bring your total to $100 or more. That makes the price for this tent just $39.58, which is the lowest we’ve ever seen. Some useful items you may want to include with this tent in order to reach the $100+ level: the Retro Rechargeable Lantern – Family Size (5312-750) for $52.99; the Clear Lake Warm-Weather Sleeping Bag (2000004445) for $31.92 with the Fold and Go Camp Pillow (8120A010) for $10.81; the Road Trip Cast Iron Grill (R9949-315C) for $29.99 with Grill Tools (2000006266) for $24.93. Check out Amazon’s great selection of Coleman sleeping bags, air mattresses, grills, coolers and other camping gear, all at great prices. And remember, you can save $20 for every additional $100 you spend by placing multiple orders. With free shipping, it’s a easy way to save as much as possible. Sharp AQUOS (LC-60LE745U) 60″ LED 1080p 120Hz Smart 3D HDTV only $1200! Last Chance Deal: Cabela’s Dangerous Hunts 2013 with Gun only $40! Designer Jewelry Clearance – Save up to 80% or more!